Well this is interesting... I'm actually creating a post about a place I've visited. I suppose we could call this a travel blog. gasps *cue the shock and awe* - My goal is to share a little information on a beautiful destination, and provide you with some recommendations if you so find yourself wanting to visit this awesome place! Additionally, Michael's and my travel vlog from the city is above! Give it a watch to see our experience first-hand! I've visited Sweden on 4 separate occasions throughout my life, and I've always thought of the country very fondly - a home away from home, even. It was actually the first country I visited outside of the US (not even Canada was first! I know, I'm a terrible North American). So, whether you're visiting during the incredibly warm summers, or venturing in during the wonderfully chilly winters, Sweden is filled to the brim with great food and an incredible culture to experience. The time of the year does not matter, the nation is practically exploding with cultural yet comfortable experiences for you to enjoy. Think lots of great food, cheaper prices, incredible museums, shopping, and nightlife. Flying into Sweden in March of 2017, it was my first time visiting during a winter month, and though the temperature was consistently chilly, my plane tickets were only $450 round trip from PDX, on Delta. By far, this was the cheapest roundtrip major airline ticket I've ever purchased to Europe. And that's the thing, if you're traveling to the Nordic companies over the winter months, you are much more likely to score a great deal. In fact, I've noticed this week that both WOW Air & Norwegian have great promotions running on their website now! Some with roundtrip tickets from US Destinations for $300. Stockholm Sweden is a port city. It's accessible by many ship routes across the Baltic Sea (perfect for experiencing a summer cruise to nearby Finland, Denmark, Poland, or Estonia!). There are also direct routes with Eurail connecting to Copenhagen and the rest of mainland Europe. Possibly it's biggest convenience are it's major airports, including Arlanda International (ARN) and Skavsta (NYO) - a popular budget-friendly RyanAir hub. Nearly without fail, every time I have searched for flights to Europe from the US, Stockholm is close to the top of the list for cheapest places to fly during the winter months. If you're looking for a cheap flight and an awesome city to your Euro-trip from, consider Stockholm as your launching pad. You honestly cannot go wrong. I might be biased, I'm obsessed with Swedish food. A trip across the Atlantic is never complete without trying a good Svenska Köttbollar Swedish Meatballs. However, flying into Sweden in the dead of winter can be... COLD. The first thing that I wanted to do upon arriving into the city was to find myself a big hot meal. My friends and I made our way to Aifur Krog & Bar, a magical little dungeon restaurant that serves authentic VIKING FOOD. Yes, they sing and they dance. They serve you reindeer, huge mugs of beer, traditional mead and if reindeer isn't your thing you can try virtually any other kind of meat ever. A bit pricey, but definitely worth the experience and the show. If you're looking to splurge for your first or last meal in Sweden, this is the place. Other fantastic restaurants within the old city include a cozy restaurant by the name of Slingerbulten serving traditional Swedish fare, and a delicious ramen stop by the name of Café Stiernan. For a quick breakfast bite, try Snickerbacken 7 on the lower side from the downtown bridges. They serve some of the best coffee I've had in Stockholm, and a ton of healthy options both for mornings and early afternoons. And seriously, if you ever get the chance to try a Swedish Chocolate Ball, do it. You will not be sorry. It can be difficult to find great affordable options near Gamla Stan. The best economical hostel option that we found close to the city center was Generator Stockholm. Just 10 minutes walk from Stockholm's Grand Central Station, Generator Hostel is extremely clean, quiet, modern, and the most convenient place to spend a night or two. Even better, if you hang around their bar in the evening, it's likely you'll be faced with a chance to dual one of the bartenders at miniature ping-pong for a free breakfast voucher! It doesn't get much better than that for travelers on a budget. Alternatively, we looked at a variety of Airbnbs in the area and found plenty of options. However for us, we couldn't deny ourselves the hostel atmosphere, and the opportunity to meet other travelers. Many appreciate staying in Södermalm (the southern island), a growing and bustling neighborhood with many great restaurants and bars. While others would like to stay close to the shopping, clubs, and Grand Central Station in Norrmalm. Just keep in mind when looking, that Gamlastan is really the center of the city with the greatest density of historical sites. With fewer accommodation options and less public transport on the small island, you may sacrifice paying a higher price as well as hiking up a bit of cobblestone. Extending out from the center of the city, Stockholm has a fantastic subway system that will help you along your way. There is so much to experience and see in Stockholm! With only 24 hours, your time will be limited but your options limitless!! The most fantastic thing I can recommend that is completely free is walking around Stockholm's Gamlastan. See the Royal Guard change at the Royal Palace. Stop into a cafe and enjoy a proper Swedish fika (Swedish term for coffee-break or snack time). There are also many free small museums around the city, like the Wooden Horse Museum. If you find yourself with a little extra time, it's absolutely worth catching a bus to the Vasa Museum, where you will learn a ton about Sweden's history as well as see one of the greatest ships, and greatest fails known to man (it's a crazy story, you can read it on Wiki...or just go to the museum and see it for yourself)! 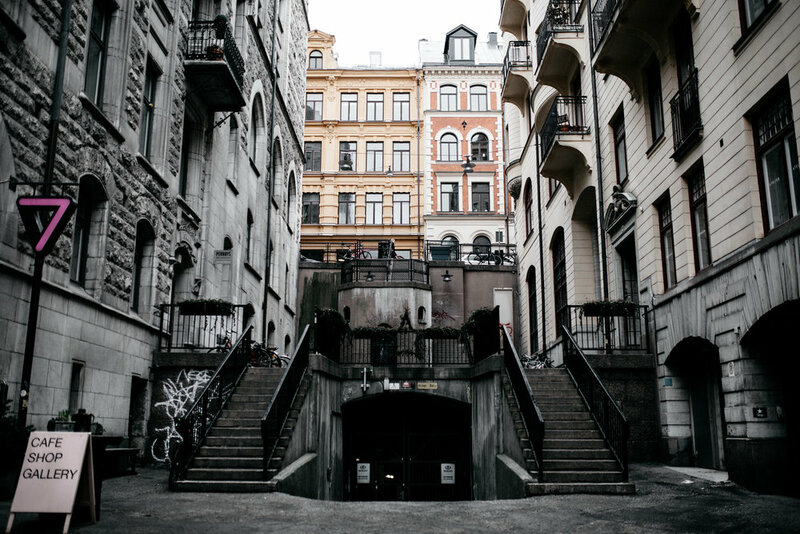 And of course, don't forget to visit the narrowest street in Stockholm, Mårten Tratzigs Grand! You'll likely find other tourists walking through and stopping for photos, so join in on the obscure sight to behold! Take advantage of the mass of shopping on Drottninggatan. We loved even just purchasing a variety of Swedish candies in one of the many candy shops on this street and gawking at all of the high-end fashion displayed in the windows throughout the shopping district. In the evening, it's best to check out the lively nightlife around Kungsgatan, especially at the intersection with Birger Jarlsgatan. You'll know you're in the right place when you're standing under a giant structure that resembles a mushroom. Did I mention I love Sweden? Down Kungsgatan, you'll find a plethora of bars and clubs. Saturdays and Wednesdays (also referred to as small saturday) are the most lively, but be sure to check out this region any night of the week for an authentic Swedish bar-hopping experience! Stockholm's infamous narrow street, Mårten Tratzigs Grand! The Nordic countries may be cold in the winter, but the extreme dip in prices and the friendly faces more than make up for the temperature disparity. One of my favorite things about the city is the vibrant color of many of the buildings near the historic center. It makes the area beautiful to photograph any time of year. From Stockholm, you can take the train to Copenhagen and further South, or alternatively hop on one of the many flights to other European destinations. Whether you're flying in just for a pit-stop before the rest of your trip, or if you're looking to experience all of what Sweden has to offer, you will not be disappointed spending a little time here.